The Simcopter utilizes a 42’ set of rotor blades to provide the necessary lift for the machine. The automobile part of the device is a 1948 Simca Topolino. 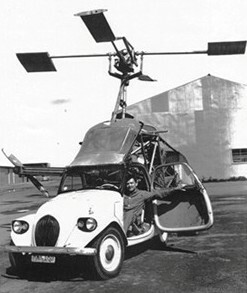 Dobbins believed that the Simcopter was capable of travel at 100 mph making commuting to work a breeze. He was employed by various aeronautical companies which included, Hiller, Hughes, and North American. David Dobbins, the creator of this unique machine, had a very unique life himself. It all started when he was born in China where his father was the Dean of Engineering at the University of Tientsin. A short time later his family moved to San Francisco where they lived on Mason Street opposite what is now the Mark Hopkins. All of his life David loved airplanes, boats, and helicopters. 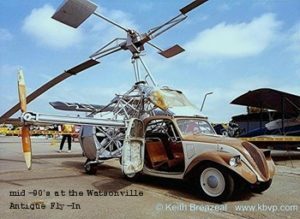 In the 50’s the family moved to Guadalajara, Mexico where David taught math at the American School and worked on his famous Simcopter. The Dobbins family eventually returned to San Francisco after 4 years where he worked for Westinghouse until he retired. 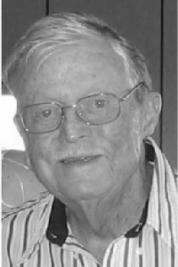 He and his wife moved to Palm Desert while he continued to work on helicopters until his death.